David Snell is a brilliant, versatile and open-minded musician and composer writing in various genres. 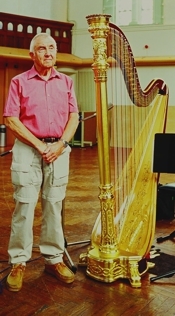 His harp music as featured on his Diversions CD features this versatility of technique drawn from David’s own long career as a harpist. Becoming famous for his creative, progressive approach to harp, coupled with the sheer virtuosity of his playing, David excelled not only in the field of classical music but notably as a jazz harpist and in the world of pop music, becoming the first-call player for any recording session requiring harp. His first professional post was as harpist with the Bournemouth Symphony Orchestra, later joining the orchestra of the Royal Opera House, Covent Garden. During the 1960s, 70s and 80s he combined these activities with freelance playing for various London session orchestras and in this capacity has contributed to many film and television scores and chart successes. David’s extraordinary ability also saw him playing in the company of respected jazz musicians such as Johnny Dankworth, appearing on many albums alongside the cream of Britain’s jazz talent. As a composer of ‘library music’, David has created many incidental scores for use on television, radio and film productions during the 1970s and 80s for companies including KPM, Bruton, Music House, Parry (USA), Ring Music (Germany) and Weinberger. Some of his production music has incorporated the jazz-rock rhythms of the 1970s, but has also featured atonal and minimalist works for orchestra. David’s concert music encompasses song cycles (for soprano and harp), a Requiem, Divertimento for Strings and many chamber works.